Europe's oldest existing airship hangar and the foundry where James Watt's steam engine was made have been named among England's most at-risk buildings. They are two of the 52 new entries on English Heritage's Buildings at Risk Register, which details the listed buildings considered most under threat. Several need more than £1m to secure their futures, the organisation said. 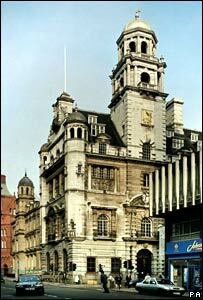 The register contains 1,235 buildings, which need a total of about £400m to be brought into a state of repair. English Heritage's list features Grade I and II listed buildings, with 88 having been removed since last year's register was published. It gives a "conservation deficit" for each site, which occurs when a building will cost more to repair than it is worth when repaired, and is therefore money which cannot be recouped from the final value after restoration. The 16 most at-risk new additions to the register would need at least £65m of public funding to safeguard them, with each one requiring £1m or more. Most in need of financial support is the Chatterley Whitfield Colliery in Stoke-on-Trent, which the organisation said would require £25m. 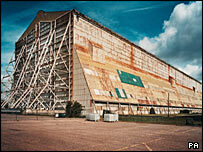 The airship hangar in Cardington, Bedfordshire, is said to be the only one in Europe to have been built before the end of World War I which is still in situ. James Watt's engine was made at Soho Foundry in Smethwick, West Midlands. English Heritage said each of those buildings would need a £5m public subsidy to safeguard their future. Other buildings added to the list this year include a former flax mill in Shropshire, the Royal Insurance Building in Liverpool and the remains of a medieval abbey in the grounds of a monastery on the Isle of Wight. English Heritage offered £4.4m to buildings at risk during 2006, but this covered just 1.3% of the estimated total conservation deficit of all the sites on the register. The organisation's chief executive, Simon Thurley, said: "We call on the government, and especially the new secretary of state, to work with us to convince public funding bodies of the value of the nation's heritage and that buildings like the ones we have identified today deserve a second chance. "English Heritage has been monitoring many of these buildings for many years and, if you look at some of the buildings we're highlighting today, you will see that even four or five years ago much more of these buildings were still standing. "They are literally falling apart before our eyes."